For a club who managed a measly two away wins all season last term, the fact that St Patrick’s Athletic have already made it two victories from two away days in 2018 is, surely, a sign of better things to come for the men from Inchicore. Home form is, of course, a worry, with a revived Dundalk due at Richmond Park on Monday night, but Liam Buckley’s outfit will take a huge dose of confidence from last night’s win at Dalymount Park. Apart from a missed penalty early in the first half, Bohs had enough chances to win the game a few times over, but the key moment over 90 minutes came from Dean Clarke, who claimed his first goal in the Saints colours on 14 minutes. A foul by Kevin Toner on Oscar Brennan after only five minutes led to the award, but Ward over-thought how he’d take it. His effort struck a post and was saved by Murphy. It seemed like it was going to be a night of fluffed opportunities as Clarke missed a clear chance on goal on 12 minutes, but within two minutes he had the Saints in front. Simon Madden did the donkey work out on the right. His cross was not cleared by Bohs and Clarke was there to score his first goal for the club from close range. Bohs, not at all keen to have a second successive home loss on the record, pressed hard but lacked the finesse needed up front. Murphy saved a header from former Saint Dinny Corcoran and then five minutes from half-time Eoghan Stokes saw his shot blocked. The second half had a similar pattern, plenty of chances for the home side but not enough to trouble ex-Bohs man Murphy in the Saints’ goal. On 56 minutes Stokes saw another shot blocked, while Ward tried his luck from distance. 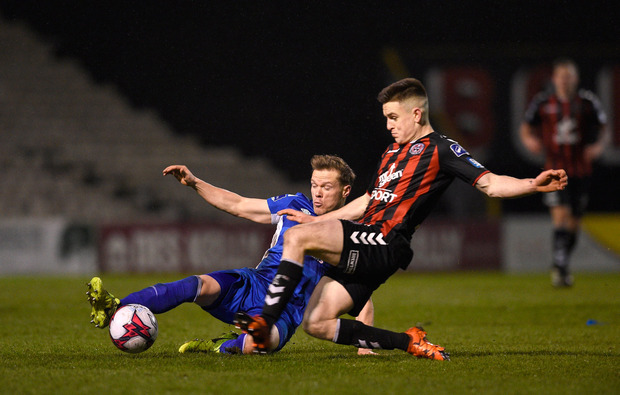 Pat’s did take a grip on affairs for a spell and Bohs, who had emptied their bench, needed sub Paddy Kavanagh to clear an almost-certain goal from Kevin Toner off the line. Substitute Darragh Markey almost nicked a goal for Pat’s on 67 minutes, Shane Supple saving a rare header from Markey. Bohs pressed right to the end, but the experience of the veterans like Conan Byrne and Owen Garvan saw Saints through. BOHEMIANS – Supple; Pender, Casey, Cornwall, Leahy; Devaney (Kavanagh, 61), Ward (Watts, 71), Brennan, Buckley, Stokes; Corcoran (Manley, 61). ST PATRICK’S ATH – Murphy; Madden, Desmond, Toner, Bermingham; Garvan, R Brennan; Byrne, Lennon (Markey, 53), Clarke (Turner, 73); Fagan (Keegan, 76).